Casafina Meridian dinnerware is perfect for cottage-style dining or an outdoor dinner party; its lattice and flower motif calls to mind the fresh air and crisp feel of a beautifully cultivated garden. Meridian fuses the simplicity and elegance of classic dinnerware design with charm and sophistication. Meridian is crafted of resilient stoneware fired at very high temperatures, making it dishwasher, microwave, freezer, and oven safe. 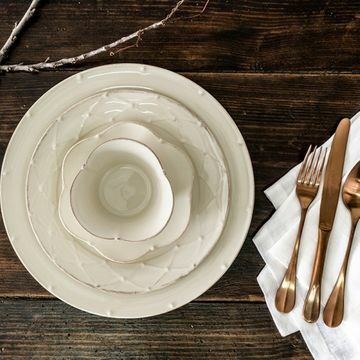 Casafina presents Meridian dinnerware in Bronze, Cream, and White to suit any color scheme, any season. Fine stoneware, made in Portugal.